Isn’t Spring beautiful and grand!! All the spring colors are starting to pop out. The tulips, azaleas, dogwoods and other early bloomers. I just love the colors that show up this time of the year. So why not make your front door pop too. 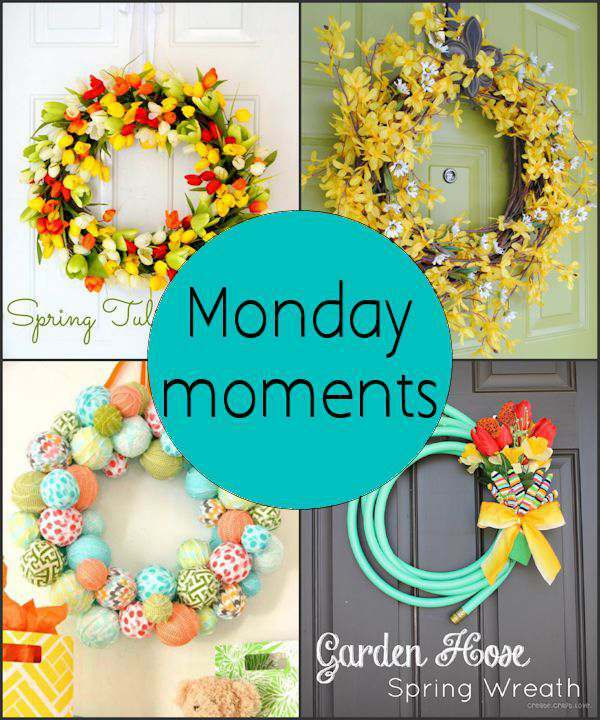 I love the colors in these door wreaths and it seems yellow is a must for a spring wreath. The first wreath is made with silk tulips and I love how the colors play off of each other. It does look pretty on the white door. The Frugal Homemaker has a great tutorial on how to make this wreath. I always knew it was spring back in Missouri where I grew up when the forsythia’s started to bloom. You had to have a couple of those bushes in your yard. Jenna shows you how to make this easy wreath and doesn’t it look yummy on her green front door. Be sure to check out all her paint colors she used in her home. This is a whimsical and really cute wreath made from styrofoam balls and scraps of material. The kids would love to help you make this one. I can see this wreath being made with many different color schemes. Since I am a gardener, this wreath screamed to me! Create Craft Love shows you just how to make this and I do believe this is going to be my next door wreath for Spring and actually her door color is the same as mine, so I already know how its going to look.